I got this one in L.A. before I moved out to L.A. I was here to scope out a possible move and thought "well, hell! what do people do in Los Angeles? They get inked!" So I visited Sunset Strip Tattoo and got this here tattoo done by Eric Blair. He has done some truly amazing work, but I guess his claim to fame back then was that he was the guy who did Tommy and Pamela's tattooed wedding bands. Why did I get a koi? I'm a fish nerd who wants to be a badass. I told him to "make me a fish, but make it mean, like with angry eyes and stuff." Once you get your first tattoo, it is really hard to stop. I mean, you've permanently scarred your body already. You might as well do something interesting with it. 1996 was the year of the rat. I was born on the year of the rat. Doesn't that make total sense? By this time, I was already living in L.A. And I worked across the street from Sunset Strip Tattoo. So I paid Eric another visit. "I'd like a rat. But make it mean, with like angry eyes and stuff." No eyes. But still mean looking. And Eric Blair once more. This was one of those "fulfilling the fix" tattoos. I just needed another one. I went to the shop, flipped through the portfolio and found the coolest, meanest thing I could find. I really wanted a skull, but thought "what am I going to do with a skull when I'm 70?" Probably the same thing I'm going to do with a scorpion at 70. 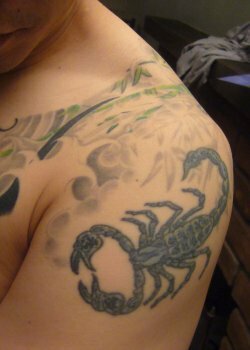 People ask me all the time if I'm a scorpio. I should just change by birthday to give this tattoo a little more relevance. So I got into a fight with my girlfriend one day. She claimed I was not into her, or not committed or something. I wanted to prove her wrong. So I went to Old Town Tattoo in Pasadena and got a heart with her nickname on it, right on my chest. Why didn't I go to Eric Blair? He would have smacked me upside the head. 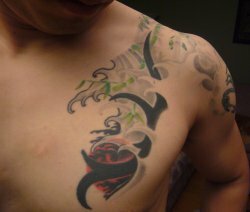 I was married to d Wife by this time, and that heart tattoo became somewhat of an issue (ya think??? ).Time to visit Eric once more and confess to him that I had strayed. I also thought it was time to connect my random animal tattoos. I felt like a freaking zoo with all of God's creatures basking on my body. I tasked Eric with the job of not only covering up the Oops, but also connecting everything into a more unified graphic. It took 2 days, but when it was all done, I couldn't look in the mirror without reflexively making some angry eyes and stuff. It was that badass.